My husband is a professional dueling piano player, so when I first saw a piano bookshelf during one of my random late night Googlings, I became obsessed. I put an ad up on Craigslist for a free baby grand piano. Surprisingly after only a couple weeks, I got a hit! An adorable old man was selling his home and needed to get rid of his 1930’s Drachmann baby grand piano. My husband (Joe) and I hopped in the car to check it out. The whole way I crossed my fingers that it wasn’t in good working condition because Joe told me I couldn’t destroy a good piano. As luck would have it, the piano was in very rough condition and I got the green light for my project! Joe played one final song on it, and got a little emotional because he’s just like that. He was sad the piano had seen its final playing days, I was excited to demo it! We decided to have a piano moving company remove the 700 lb piano from the house because A) we didn’t want to be liable for any damage to the property, and B) we didn’t want to take the chance of injuring ourselves. The piano moving company first took the piano to their warehouse and removed the harp for us for free. That saved a LOT of grunt work and time. The gutting process was a lot more time consuming than I originally thought it would be. I literally put blood, sweat and tears into it. I was told that the piano was walnut, but as I got into the project I soon found out it was pressed wood with very pretty walnut veneer. Unfortunately the veneer was damaged during the gutting process, so I had to chisel it all out, sand it down, and install new veneer. I used the piano lid as the new bookshelf backing. The shelves are new wood. The piano keys had to be sawed off from the rest of the action and glued in place. 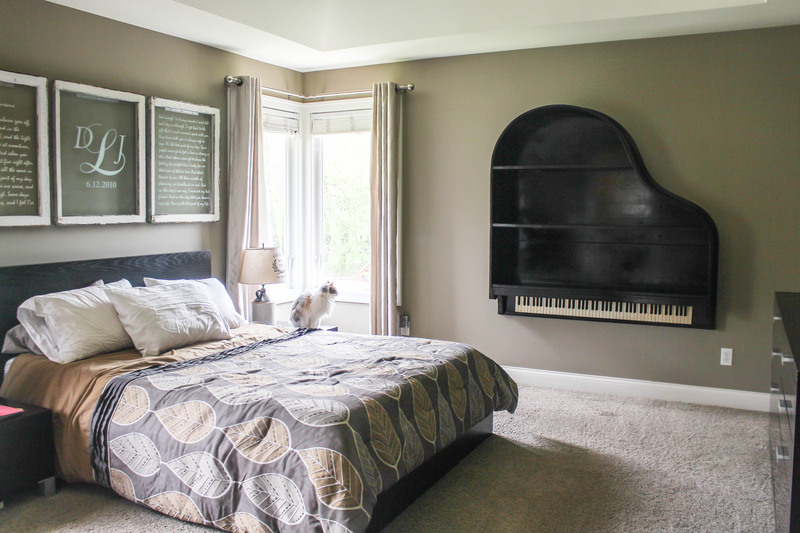 I primed and painted it an espresso color to match with the rest of our bedroom furniture. The fallboard I left unpainted because it has the original logo. To hang it, we temporarily stacked scrap wood up from the floor and placed the piano on the stack while we screwed it directly into studs with heavy duty screws. I saved one of the sawed off piano key hammers that has a date stamped SEPT 1930 and plan to put it in a shadow box and keep it with the piano. I am beyond thrilled how it turned out!